This is a very short book (84 pages), but it is very important in the study of Scottish Rite history. In this book, Kamel Oussayef takes us back to the mid-18th century in Paris, France, at the time of the genesis of the Ancient Accepted Scottish Rite of Freemasonry. 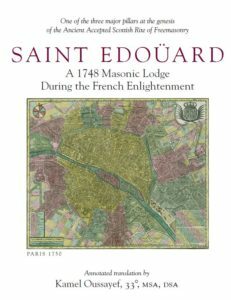 His book is an annotated translation of an important masonic manuscript of Saint Edouard, an early Scottish Rite Lodge in 1748 Paris. It is a rare historic document of one of the embryos of the Ancient Accepted Scottish Rite of Freemasonry. The Supreme Council of the Northern Masonic Jurisdiction commissioned it and made it available in both a regular printed version as well as an electronic one. All the proceeds go to the Masonic Scottish Rite Museum and Library Fund to help finance future publications. To purchase the book, visit the Northern Masonic Jurisdiction’s online shopping cart. An Amazon Kindle version is available as well.